Photothermal IR is a breakthrough technique that has opened up new applications for infrared spectroscopy in life science and pharmaceuticals. 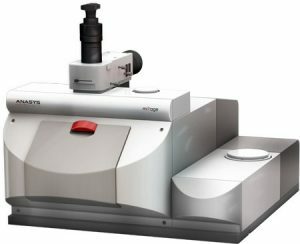 This new analytical method can used in your lab with the mIRage optical IR spectroscopy and imaging system from Photothermal Spectroscopy Corp. Traditionally, infrared spectroscopy has been limited to analysing molecular vibrational absorption for chemical specificity. 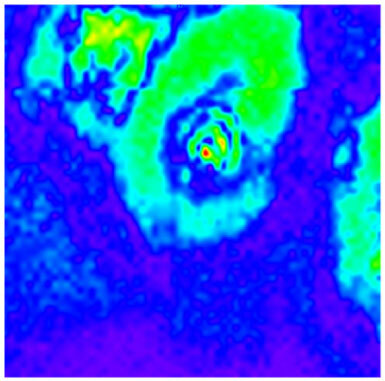 However, a new technique based on photothermal microscopy has now opened up infrared spectroscopy to new applications. One such application is bioanalysis, an area where it has previously been difficult to study how molecules perform in a living system, because of the challenges in gathering data about spatial and temporal dynamics. Porcine stem cell – Reflection mode single wavelength image (1540 cm-1) extracted from hyperspectral data set. 30 x 30 µm image with 500 nm point spacing, 1 spectrum/point (1s). As an example, the technique has been used to map lipid droplets and membranes in cancer cells, which are highly relevant to metabolic processes. Lipid droplet distribution can be visualised clearly within individual cells, with each droplet clearly visible. Sectioning images were acquired by changing the depth. This enabled the lipid droplets to be mapped in 3D, within the single cell. Further details and example images are available in an article in Photonics Media. Mid-infrared photothermal microscopy MIP bridges the gap between FT-IR (Fourier transform spectroscopy) and AFM-IR (Atomic Force Microscopy combined with IR spectroscopy). A mid-IR pulsed, tunable laser heats the sample. When the IR laser reaches a wavelength that causes molecular vibration in the sample, absorption occurs. This creates photothermal effects, which are measured by a visible probe laser that’s focused to a 0.5 µm spot size. This is how O-PTIR overcomes the usual IR diffraction limit. The part of the reflected visible laser signal that’s modulated at the IR pump laser repetition rate is directly proportional to the absorption coefficient of the sample at that particular wave-number. The IR pump laser can got through through the entire fingerprint range in a second or less, which provides an IR spectrum. O-PTIR works in reflection mode, which gives you sub-micron resolution from a non-contact optical method. Measurements are collected quickly and easily without sample contact. Spectra quality is comparable to FT-IR, but without the dispersive artifacts that are such common problem in ATR. Because it uses reflection mode, samples do not need to be thin. Sample preparation is therefore simpler and the whole process is faster.